I haven't been posting weekly pregnancy updates for Baby Bum on the blog, but I have definitely been taking weekly pictures and keeping my own pregnancy journal. I thought I would share some of what I've been doing with you, mostly because I want to show you the gorgeous journal I've been using and how I've been keeping track of this new adventure. P.S. 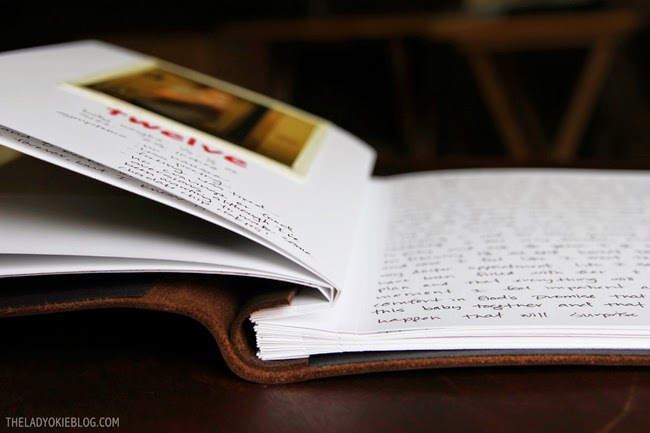 Scroll to the bottom for a giveaway of this journal! The giveaway included one book with personalization on the front cover, which you can see in the picture above. Initially I didn't know what I would use the book for, so I chose to put my initials AB on the cover along with the reference for Philippians 4:6-7, which is one of my favorite Bible verses. 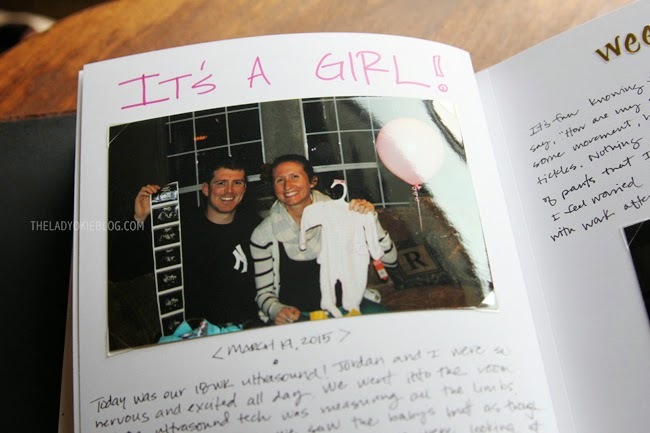 Soon after winning the giveaway I found out I was pregnant, and I decided to use my book as my pregnancy journal! 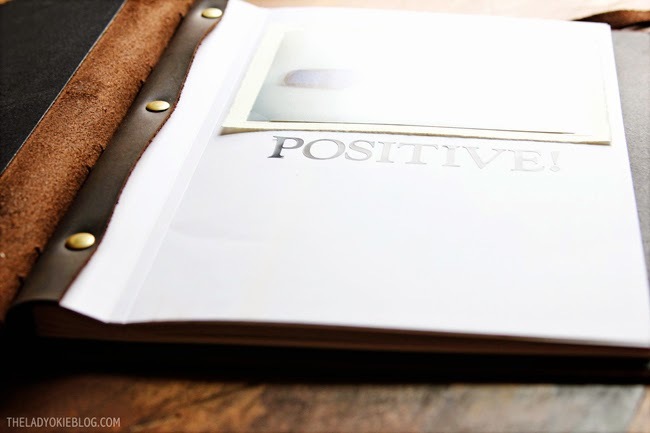 The book is made from quality, top-grain leather and bound with white, unlined pages. I actually put off starting on my book for a little bit because I was worried about messing it up. It's so pretty! The first few pages of the book are more of a diary entry. I wrote about initially finding out, how I told Jordan, and how we told our parents. 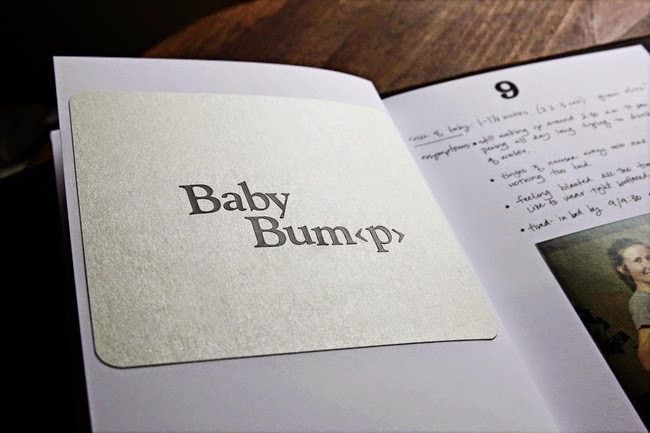 The rest of the book features weekly bump pictures and general updates on the size of the baby and my symptoms or anything else that is notable about the week. ^^^For my weekly picture, I decided to borrow an idea I saw a few years ago on another blog. Every Wednesday night after work, I put on the same shirt and stand in the bathroom and take a selfie in the mirror. I feel like that best shows the weekly growth than if I were wearing a different shirt and in a different location each time. I feel very thankful to have won this beautiful leather journal and be able to make this keepsake for Baby Bum to have one day. I also love that I've been able to use some stickers and paper to make each week look a little unique. I'm sure it will be fun to look back and see how I was feeling as this pregnancy progressed. If you are looking for a journal or sketchbook that is unique and will last, I recommend checking out Blue Sky Papers. I love the customization options, the real leather, and the personal customer service. 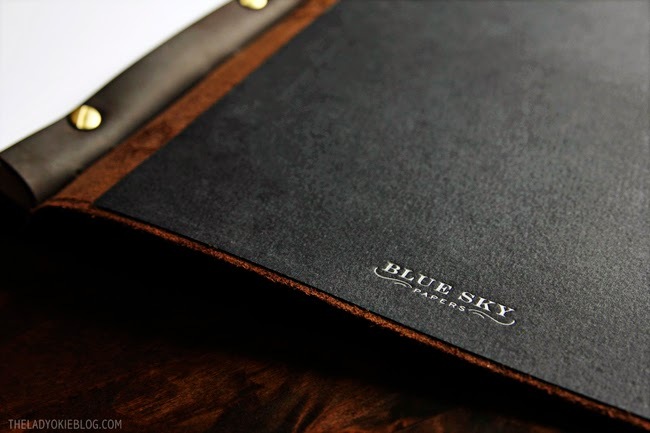 I am SO excited to partner with Blue Sky Papers to give away one of these leather portfolio books to one of you! Enter using the Rafflecopter below. Good luck! *I am not being compensated in any way to write about Blue Sky Papers. They did not contact me to do a giveaway post or ask me to write about my experience. I simply wanted to share their beautiful work with you, and they kindly offered to give away a book! 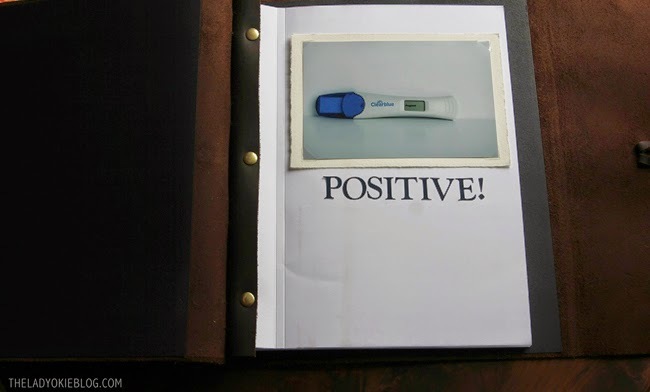 Do you have or did you make a pregnancy journal? Is this something you think you will want to do? What a beautiful journal! While I've written a few things down about my pregnancy throughout, I wish I'd started a more formal, separate journal. This is such a great journal. I love journals of all types and use them for writing down my throughts, journalling during times spent with God and many other things. you are so good at book-making! love this idea! we are currently praying about starting to pursue foster care/adoption in the next few years so i would use the book to document our feelings & thoughts as that progresses! I want to use the book for funny conversations that my daughter has. She's 20 months and I can't wait for them to start. I love, love, love the way you're doing this! Treating journals as scrapbooks makes them much more fun. Do you print your bump photos weekly at home, or do you get a bunch printed via a service or at the CVS/Walgreens/whatever? I'm curious how often you keep up with adding those, because I think that would be the biggest sticking point for me. Oh, and I would love to follow your format but use it for general life updates. This is kind of how I did my journal while I studied abroad, though I wasn't printing pictures. I would tape in pieces of ephemera from my travels: fabric scraps, product tables, napkins from restaurant destinations, etc. Since I'm also doing Project Life, I usually just wait and print a bunch of photos at once either at Walgreens or I use an online site: Persnickety Prints. Walgreens was making me mad because their printing is not great quality, and I could actually tell sometimes, so since I want to print good quality for my PL pages, I've been using Persnickety. Then I don't actually have to leave my house at all! However (sorry, this is getting long), my actual goal is to save up for an at-home photo printer. I agree. Sometimes it does seem a bit strange to me when people document all their really personal thoughts about pregnancy on the blog, but then again some people like that, so it's just personal opinion :) But YES so true. Hopefully I can look back and see how my body changed and the things I was thinking as I went through this time. It's been a fun thing to work on the last few months! I would save it for my first pregnancy! It's so pretty! I wish my mom had done something like this to look back on it later. I will definitely do this if we ever have children. I just found out a friend of mine is pregnant, so I think I'd give it to her to use the same way you use yours. SO pretty!! and i loved a look inside, too!! A few things-- this journal is unbelievably adorable!!!!!! 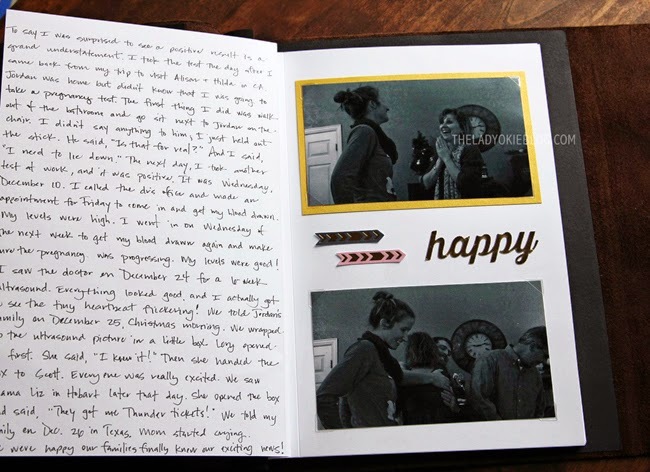 I love that you're keeping a handwritten journal of your pregnancy! Not that I see anything wrong with those who document it on the blogs, but I think when it's my turn, I'll take weekly photos for myself, write letters on real paper, etc, obviously with the occasional update via blogging! I'm keeping my fingers crossed I win! This journal is too perfect. Oh- and I would totally use this as a prayer journal. :) since I'm nowhere near being pregnant. Hehe! You have done an awesome job! I love the snapshots that you shared with us. A true treasure for your family to look back on years down the line! I might use ours to chronicle our relationship through the years. We've been taking a photo each month on to look back on our first year together so I might start more detailed with the first year and then continue to add on to it each year with a recap of our wedding anniversary. Beautiful journal. I think I'd turn mine into a prayer journal for Man Cub. I love seeing into your journal! I really haven't done a good job at all of documenting anything, but it's mostly because I have had very little pregnancy symptoms and I'm just now starting to show a little. So there hasn't been much to document! But I definitely want to make sure I keep up with updates somehow! Yours is so fun looking with the scrapbooking pages done up! If I won I would use it to make a journal documenting our move and new life in the UK. LOVE LOVE LOVE this!!! I'll probably do something similar when the time comes! What a beautiful journal! This will be a great keepsake for Baby Bum! Wow - that journal really IS beautiful. This is such a good idea and I know you'll love looking back on it once she's finally here! It also seems like a genius idea to take pictures in the same shirt. That is a great way to keep your memories of the pregnancy journey. You are so good at scrapbooking. Very impressed. Thanks, Kerry! Scrapbooking is something I really enjoy and something I've done for a long time, so it's familiar to me. But it can be very overwhelming if you aren't used to it. What a BEAUTIFUL journal! 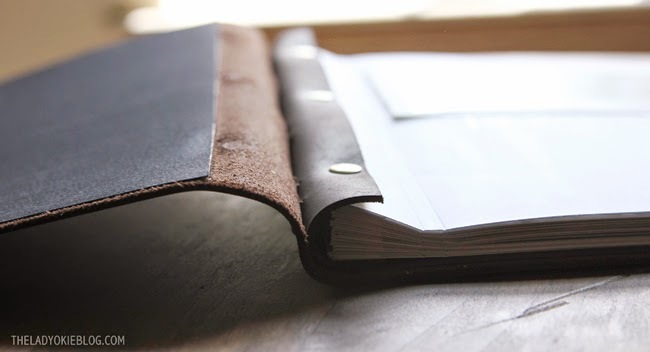 I have almost purchased a leather, 'fancy' journal like this a dozen times but have always stopped for one reason or another. 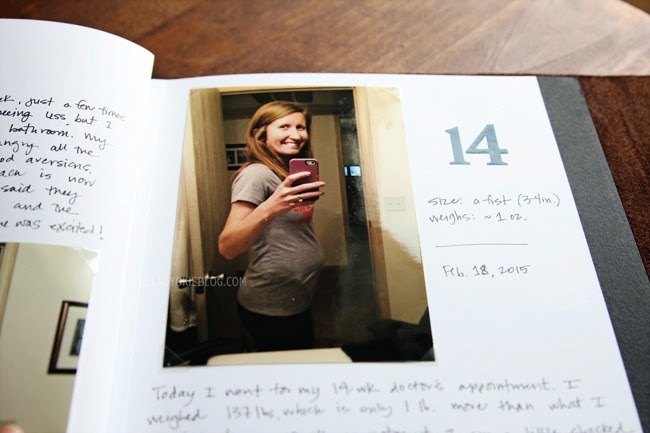 I love how you're documenting your pregnancy and I would probably use the journal for a FUTURE pregnancy as well! This is a gorgeous journal! I love how you have chosen to use it. If I had one, I'd use it for the exact same thing when it's my turn!! This is so cute! I love how you're doing a bit every week and making it so cute, too. I think that will definitely be something really, really cool for Baby Bum to look back on when she's older! 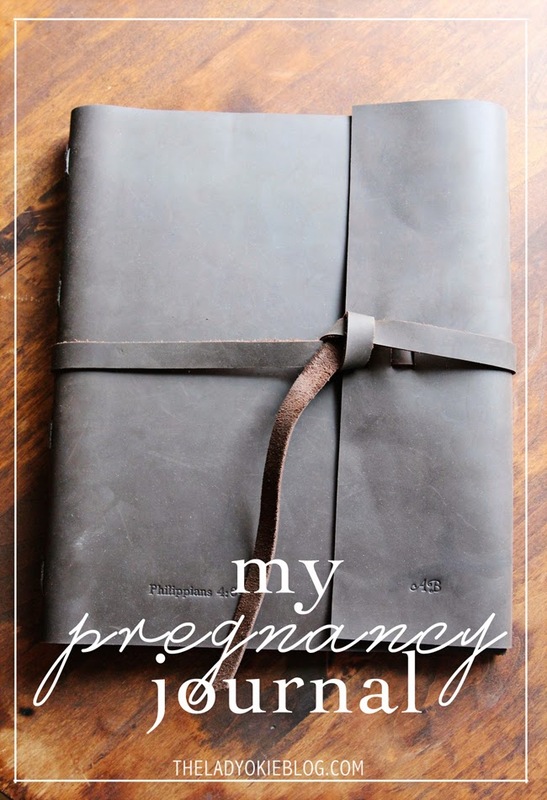 I'm not sure what I would use this journal for, but a few things that come to mind would be, a prayer journal, a pregnancy journal (hopefully in the near future), a travel journal, or a journal cataloging my first year of marriage. Oh I love this! Thanks for sharing something so personal with us. I love the idea of saving this and passing it down to my child. I would save this for when we start a family! I would totally make it a pregnancy journal (12 weeks today!) OR for my baby shower:) This giveaway could not come at a better time:) Thank you! It's beautiful! And by 'it' I mean the gorgeous leather journal AND the journey you are tracking. What a treasured keepsake it will be always. Thanks! It's been fun to work on this over the last few months. Although I can see how people say they have stuff like this for Baby #1 and then nothing for later babies. It does take dedication to remember to do it every week! I admit... a few times I've been behind by a week or so. I love journals! Plus, anything that is customized is extra awesome. I want one! I did not do a pregnancy journal, I sort of wish that I did, but now I'm working on a "first year" smash book (have you ever heard of a smash book?). I have big plans, hopefully it will all work out! Awesome! Yes, I've heard of a smash book although never really looked into making one for myself. I'd love to see some of it on the blog at some point when you have more done. Very cool! I totally know what you mean when you say it's hard getting started because you don't want to mess up the book. I'm the exact same way! I'm so glad you liked it! I'm SO glad I won Jenna's giveaway and started making my journal. Nothing I would have used would have turned out as pretty :) Thanks so much for collaborating on a giveaway too! P.S. I love your journal! You are definitely putting yours to good use! Love how you have arranged the scrapbook! If I won, I think I would either save it for journalling or scrapbooking about anything exciting that may come up in the near--perhaps trips and the like, or maybe use it as a place for my autograph collection. On the other hand, I might be tempted to give it to one of my friends graduating from high school this year...but I'm thinking that temptation probably will not prevail. I love that you were able to make it into whatever you wanted because it's blank. Sometimes "baby books" are too scripted and there's not enough room to write what you want. How sweet it will be to show it to your little someday! I love your baby bum(p) journal! I would use mine as my next journal. My current one is almost full! I would love to use it as a gardening journal. We are adding lots of new veggies, compost beds, and fruit trees since summer. What would I do with it? Well, at first I would hoard it like I do all my other journals and then I would find something really special to do with it. I have always thought it would be fun to have a guest book in my house and take it when we move abroad, etc. so maybe I would use it for that. 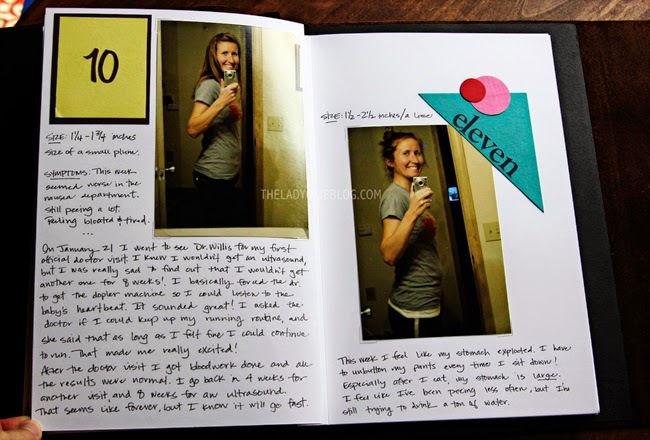 I do love your pregnancy journal and that is a fun way to keep track of everything. AMANDA - TEN POUNDS??? Your poor Mother! Hopefully your baby won't be as big because for reals! What a gorgeous journal!! I would love to get my hands on one of these, but I doubt I'd use it even a fraction as creatively as you have!! well what a beautiful journal! not to mention i just love the way you are using it as a pregnancy journal. if / when i get pregnant one day, i don't feel like putting it on the blog is what i want (personally!) so i would totally do the same thing. in fact, if i won the giveaway, i would save it for the pregnancy! ps. your handwriting is AMAZING. That journal is beautiful! Also your natural gift for scrapbook-y type things is SO great. I hope that I can force myself into liking it some day because everything you make is just going to be SO special later on down the road. Not going to lie, I'm not sure what I would use the journal for but I would find something. I generally wait till I'm inspired and then use it for something awesome haha. Also, I LOVE your choice of personalization! I would love to use this journal to chronicle our upcoming honeymoon in Thailand! I absolutely love doing travel journals and this would be the perfect one for it! I absolutely love this idea! We are in the beginning of the adoption process so I would use this journal to record the process and adoption of our baby when we get matched! I think that's such an awesome way to use it, Dawn! I'd love to make a journal, similar to what you did, to track my pregnancy. I'd love to put weekly updates, lists of names we're considering, funny things my husband says, etc. I would use it as my jewelry business portfolio with photo and linesheets! I love how you used this, Amanda! It looks so fantastic and I love how it is more than a scrapbook, and more of a journal. Love love love it! So glad you won.